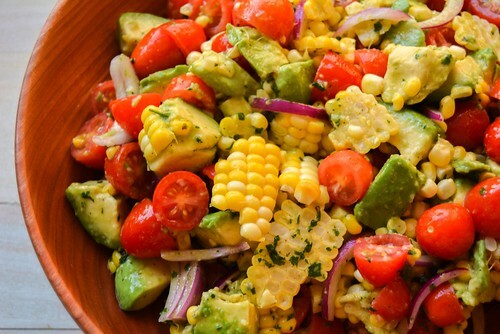 Jersey Corn, Tomatoes, Avocado….these are a few of my favorite things (In harmony to the Sound of Music tune!). But seriously, there is not much more I love in the summer than juicy, ripe tomatoes and sweet Jersey corn. When you pair that with the ultimate ingredient, avocado (which is my favorite just about anytime), you’ve got a star studded tomato, corn and avocado salad. As if you need any inspiration to make this. But, I’ll humor you and do just that. paired with grilled chicken for a weeknight meal!